There was thing of interest on TV this year. Lime Grove Studios, in which many a Sixties episode of Doctor Who had been recorded, was closed down in 1991. To commemorate it's passing BBC 2 decided to dedicate a whole day to classic programmes made in the studios. So many classic programmes were re-shown that day: Bill & Ben, Z Cars even Quatermass. And amongst all this was something never shown on TV before: the original pilot episode of Doctor Who. Those who had already bought 'The Hartnell Years' on video (see below) would have already seen a version of the Pilot but seeing it on TV was still something special. 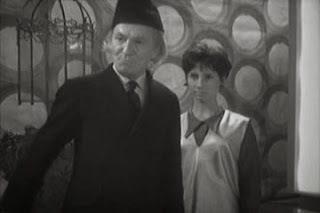 The Pilot more or less follows the plot of the first episode that was shown on 23rd November 1963 but there are a few differences. Susan is more quirky and 'alien', the Doctor is a lot less likable and, due to a technical error, the TARDIS doors refuse to close and bang about in the background for much of the second half of the episode. Due to various reasons, not least technical issues, the episode was re-made but it was interesting to see what kind of series we could have ended up with. Just as the novelisations had come to a natural end so the VHS releases start to speed up. There were no less than ten video's released this year. The stories released were: The Krotons, The Curse of Fenric - Special Edition with deleted scenes reinstated into the story, Planet of the Spiders, City of Death,The Three Doctors, The Masque of Mandragora, The Deadly Assassin and finally The Sontaran Experiment and Genesis of the Daleks that were released together in a double pack. In addition there were two special releases from the BBC: The Hartnell Years and The Troughton Years. These videos were presented by Sylvester McCoy and Jon Pertwee respectively and their chief purpose was to showcase some of the surviving episodes from the black and white era of Doctor Who. It was obviously felt that, with so many black and white episodes missing from the archives, these compilations were the best way of releasing some of the remaining episodes on VHS. 'The Hartnell Years' contained the original Pilot episode, the third episode of 'The Crusade' (at the time its sole surviving episode) and the fourth episode of 'The Celestial Toymaker'. 'The Troughton Years', meanwhile contained episode 2 of 'The Abominable Snowmen', episode 3 of 'Enemy of the World' and episode 2 of 'The Space Pirates'. In all cases these were the only surviving episodes of those particular stories. Meanwhile, with the lack of new Doctor Who on TV, independent film and video makers were stepping in to try and fill the void. One such person was Bill Baggs whose BBV company released 'Summoned by Shadows'. This Doctor Who-ish short film starred Colin Baker and Nicola Bryant, who had played the Sixth Doctor and Peri. 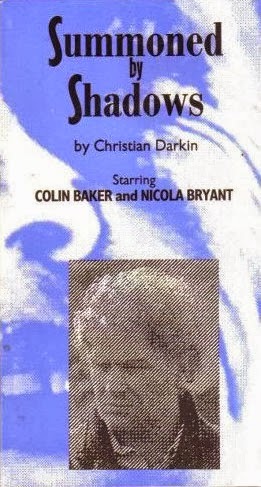 Here, Colin played a mysterious traveller with no name (although the credits refer to him as 'The Stranger' while Nicola plays his companion/assistant Miss Brown. It all sounds quite familiar and with good reason as the film was intended as an homage to the series. The film proved popular so, not surprisingly a sequel was soon in the works. Finally a number of non-fiction videos were released this year. 'The Panopticon tapes' (of which there were five) were released by the Doctor Who Appreciation Society. These tapes contained highlights form a number of conventions organised by the group, not least of which was the huge Paniopticon events that ran regularly throughout the Eighties and Nineties. Also released was 'Just Who on Earth is Tom Baker?' which, as its title suggests, provided an insight into the somewhat bizarre life of Tom Baker. There were a couple of music CDs from TV series composer Mark Ayres. The first was a CD of the music from The Curse of Fenric. The second, while not specifically a Doctor Who CD, did contain some Who related music. This was 'Myths and Other Legends' and, for the most part consisted of music that Ayres composed for the Myth Makers series of interview videos. Also worthy of mention is that 'The Pescatons', the Tom Baker audio story first released in the mid-70s, was re-released this year. 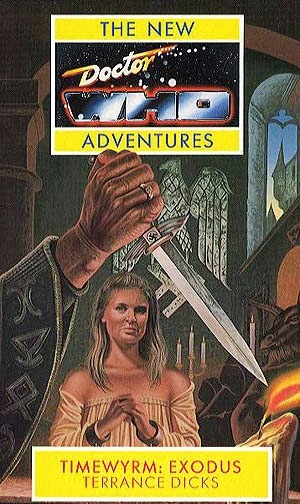 Almost certainly this was in order to tie-in with the publication of the novelisation of this story. Happily, though, fans were not deprived of Doctor Who fiction for long. 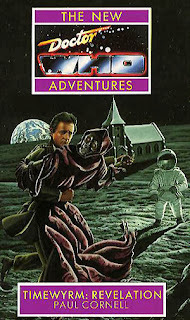 Virgin Publishing had purchased Target's parent company W H Allen and they decided to publish their own original novels featuring the Seventh Doctor and Ace. 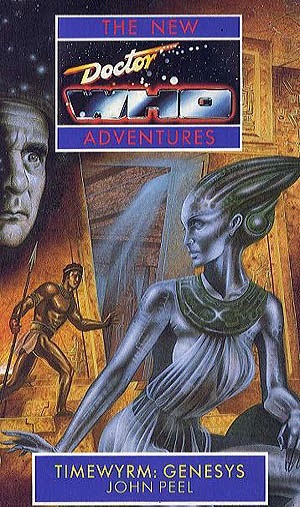 This new series was called The New Adventures and was intended as the official continuation of Doctor Who albeit in print rather than on TV. 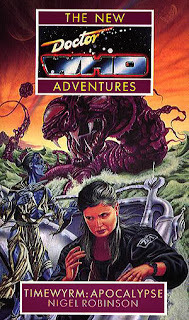 The books were also aimed at an older audience than either the TV series or the novelisations and intended to tell "stories too broad and too deep for the small screen." The first four novels in the series were published in 1991 and were linked by a new enemy for the Doctor - the Timewyrm. The first book is called, appropriately enough, Timewyrm: Genesys and sees the Doctor and Ace encountering an alien posing as a goddess in ancient Mesopotamia. In attempting to stop the alien the Doctor inadvertently gives her some of the powers of the TARDIS and ends up creating the Timewyrm. The next three books in the series see the Doctor and Ace hunting the Timewyrm through time and space. In Timewyrm: Exodus they travel to alternative timeline where the Nazis wons World War Two, then they travel to the far future in Timewyrm: Apocalypse. Finally, in Timewyrm: Revelation, the debut novel for one Paul Cornell, the Doctor takes a trip into his own mind for a final showdown with the creature. 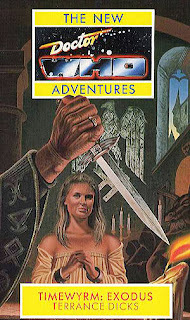 In other book news, 1991 also saw the publication of 'Time Lord', a new attempt at a role playing game from Virgin Publishing. This book was a new attempt to create a Doctor Who roleplaying after the somewhat unsuccessful attempt in the mid 1980s. Sadly this attempt didn't fare much better. Also published this years was 'The Gallifrey Chronicles' - a coffee table book that looked at the history of the Time Lords and Gallifrey - and 'The Terrestrial Index' by Jean-Marc L'Officier. This was the follow-up to the re-printed 'Programme Guide' and contained details on all of the comic strips and short stories published to date, other spin-off merchandise as well as a fictional history of the planet Earth as seen in the TV series. Finally, after an absence of some years, the Annual was back. 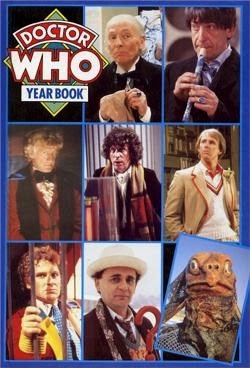 It was called a Yearbook rather than an annual and was published by the same people behind the Doctor Who Magazine so at least readers could be confident that the book would be factually accurate. Just like the Annuals of old, the content of the Yearbook was primarily made up of short stories and comic strips with some factual articles thrown in. By 1991, Doctor Who Magazine was publishing 13 issues a year rather than 12 which, of course meant 13 comic strips as well. The year kicked off with The Mark of Mandragora. Continuing on from the two prelude strips published at the end of 1990, this story saw the entity called the Mandragora Helix using the TARDIS to return to Earth. Once on Earth, the Helix creates a new drug that transforms innocent night club goers into its slaves. The Doctor and Ace, assisted by UNIT under the command of a new character called Muriel Frost, have to stop it from taking over the world. Following this somewhat epic adventure comes the culmination to a long running storyline. 'Party Animals' finally sees the Doctor arriving at the birthday party of his friend Bonjaxx. Amongst the guests is Beep the Meep, Death's Head and a supposed future version of the Doctor. In 'The Chameleon Factor' the TARDIS is somewhat out of sorts following recent events. As part of its recuperation it creates a new look for the console room that stays with the comic strip for good few years. The two other main strips this year were 'The Good Soldier' which featured the Cybermen invading 1950s America and 'A Glitch in Time' which saw the Doctor and Ace investigating a temporal paradox in Earth's pre-history. Marvel also published two 'Specials' this year. The first was released in the Summer and was, primarily a guide to the locations used for filming Doctor Who. It also included a comic strip pitting the Doctor and Ace against a sand monster on the beach. The second was a UNIT-themed Winter Special. As well as articles and fiction focussed on UNIT there was a comic strip, 'The Man in the Ion Mask' featuring the Third Doctor, the Master and UNIT. This was the first time that the Magazine had published a new comic strip featuring an old Doctor. It wouldn't be the last.